3. Those with holes through the middle. 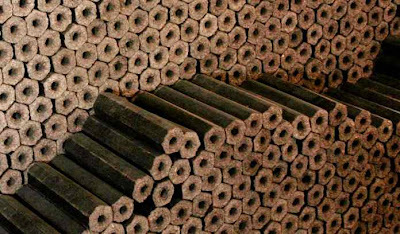 All types are classified as briquettes but are made using fundamentally different techniques. Each type looks and feels quite different. Each type stores and handles differently. Each type displays very different burning characteristics. 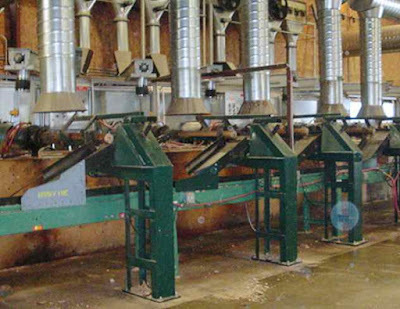 The solid log types are made using a ram or piston type press which simply hammers or squashes layers of sawdust together under great pressure. These briquettes are much lighter in colour because the temperature is not as great in the process. They also break more easily and have a much looser looking texture. When they burn they expand up to twice or more their length in the fire and become spongy in texture. They are not a very good type of briquette. See previous several blog posts for specifics. Above is a piston or ram type of briquette press. This type usually has a big flywheel to drive the ram. It uses uses less energy and takes a lot less maintenance. 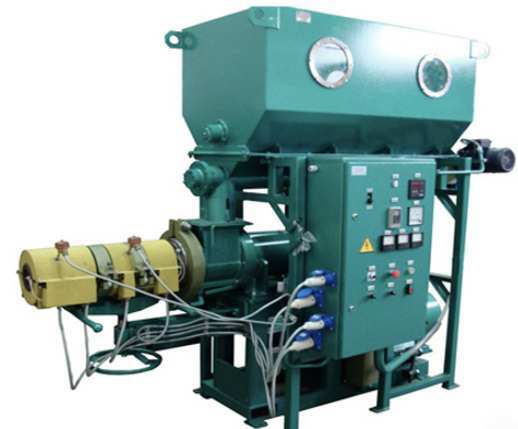 The put through of piston press machines is also much greater than screw presses, in fact about 6 times more output per hour on average. 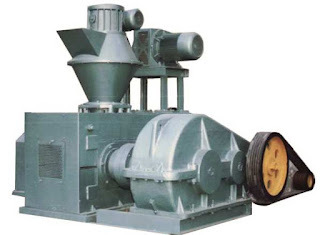 Personally I do not like the hammer mill solid type of wood briquette because of the way it burned. As I have said and show in previous posts, they expand to over twice their length in a fire. They soften out as they expand and therefore burn more like wood shavings. Solid briquettes give the same heat output but the burn characteristics are what I find unsatisfactory. 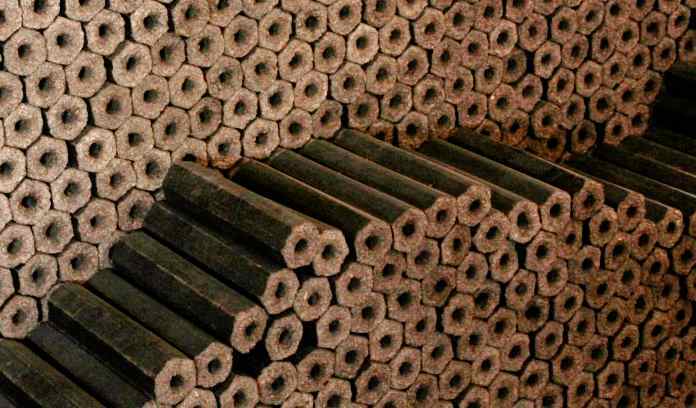 The briquettes with a hole through the centre are extruded from a screw press using huge pressure. The enormous pressure generates a great deal of heat and further heat is added by electric heaters to closely fuse the particles together. It also makes the briquette have a dark and partially carbonised burned look to it. This glossy carbonised exterior helps protect the briquette from moisture. The hole is nothing more than the byproduct of the screw thread passing through the middle. This type is usually compressed to just 10% or less of the original mass. The resultant briquette is very dense. Above is a screw type press. Note the extrusion tube in which is the compression screw, and around which are the electrical heaters in yellow. Screw presses wear out the compression screws quite often and they use a good deal more electrical energy. They also are slower and produce much less per hour than the piston or ram types. However, the screw type press produced a much superior type of briquette. These briquettes are naturally going to be a bit more expensive to produce. 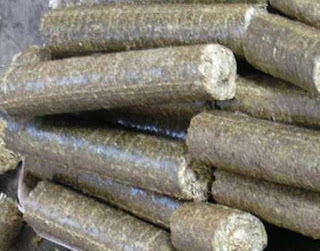 The screw pressed and heat treated type of briquette is very dense. it has a carbonised outside which makes it easy to ignite and also helps it to resist moisture while in storage. It does not expand at all in the fire. It burns for up to twice as long as the ram pressed type, and can be burned along with other fuels including coal. I find that it is possible to get a much longer burn time overall with these briquettes. It still has negative aspects, the main one is IT BURNS TOO QUICKLY. It is therefore not great for long time burning - such as over night. 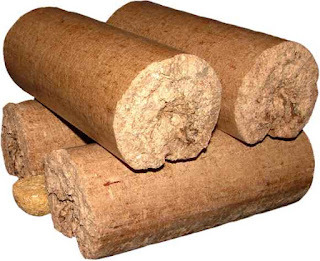 There is another type of solid wood briquette which is not easily available in Ireland, although I have seen it advertised in the UK. This type is a fused wood briquette. It looks a bit like the solid hammer mill type BUT try breaking one and you will find just how hard it is. The very high pressure at which this type is manufactured causes it to heat and the wood to FUSE into a solid mass. Because this type is so solid and hard it burns like limps of coal and can burn right through the night. I have received information from Hermanson's in the USA who manufacture this type. Hermanson's have developed their own process and machinery. This is a very desirable type of wood briquette and the only one that I would have any real interest in using. I have tried the other types and am not impressed. There are 2 main differences in your ecologs. Those made from softwood and those made from hardwood. The ones you like, those 'with the hole' are made from hardwood trees in forests in countries such as Indonesia, Malayasia and Thailand. Both work well, but it all depends on how 'eco' you want to be. We are Kerry Biofuels sell both. Softwood logs made in Co Limerick and Bord na Mona logs imported from Malaysia.